Bookmark, or Ars Sacra card, designed by "famous artist-nun B. Hummel." 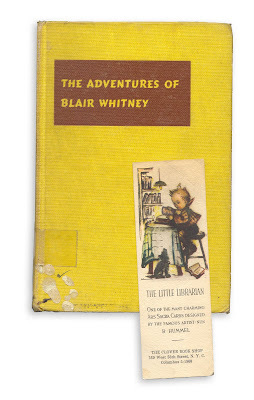 Found in "The Adventures of Blair Whitney" by Jeanne Massey. Published by Henry Holt, 1954. This is a great site. I love old books and especially love the little notes and things left in them. I remember seeing that Hummel picture a long time ago. what a unique blog! i love the smell of old books, i bet your house smells great because of them! Wait, Hummel was a nun? Is that what it means?